The fieldwork is the most exciting part of our research. It is very challenging, everything is hard to plan, but it is adventurous, full of surprises, interesting meetings and conversations. For my field research on anthropology of seawater I meet, talk and listen, listen and talk to such a different people.Yesterday I was talking for 4 hours with one lady, who is also very active in the promoting of the idea of the railway Kirkenes-Rovaniemi. Unexpectedly for me, I got today a chance to join two men for their private fishing trip outside of the fjords in the open ocean. I couldn’t miss this opportunity, even I was warned that it maybe quite shaky. However, I underestimated my abilities and four of nine hours on the tiny boat, I was struggling only with surviving, because I was completely seasick and I tried to stay on board because it was shaking really badly. I got some relief first after returning to the fjords and short break on one island. 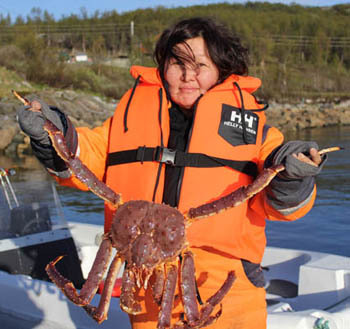 A huge cod (10 kg) and King Crab – is a result of this fishing trip. Not too much, but they were enormous! My plan for tomorrow (04.06) does not fit to my previous ideas at all. I found a driver, who can bring me to the northernmost point of mainland Europe ((The North Cape is on Magerøya island) and to the northernmost fishing village in Norway and Europe, Gamvik (100 inhabitants, 71°2′28″N 27°51′5″E). Gamvik is located on the Nordkyn Peninsula, directly on the Arctic Ocean coast. I planned to go first to another village, but here, in the North you better have flexible ideas, but not a plan. Yesterday it was a snow storm in Gamvik area and the road was covered by snow. Should we change the summer tires? Yes that’s so true with the plans and the ideas. Maybe we should remember that in life too, and things may become a bit easier: strict plans about what, how and when to do are very likely to fail. I talked recently to somebody at Cambridge University who has a project with 200 employees. He says wisely: in project management you have three main factors: the aim for a result, a time window and a budget window, and you’re supposed to build your plan around these. If you keep all these three fixed, you are almost certainly bound to fail. If you keep one flexible, you may be able to adjust. If you have two flexible, you will have all possibility to succeed. In other words here: you succeed because your aim for results and the way to achieve it is flexible. Imagine if your whole project depended on going to the village that you couldn’t reach. Then you would have failed. Now you succeed because you keep your destination and your intra-project timing flexible. That’s great stuff, and we look forward to hearing more!